There’s nothing better than the smell of pumpkin spice, right? How about adding it to your child’s play dough and then throw in some additional sensory activities to go along with it?!? Meagan from Integrated Learning Strategies is sharing an inventive way of using her pumpkin play dough recipe with a captivating game of “Where’s Waldo!” Talk about taking fall sensory fun to the next level! Fall is my favorite time of year and also one of the best seasons for getting children involved in more sensory play activities that help them learn and grow. Many of the students at our center constantly need that sensory stimulation to help sharpen their minds and bodies for higher learning in the classroom. 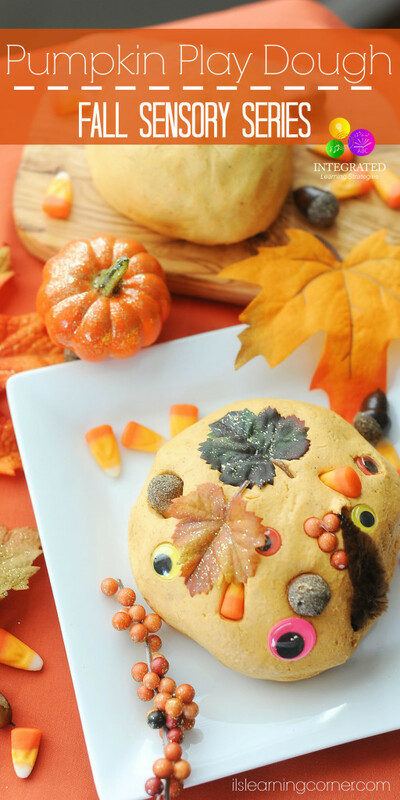 The fall season and the upcoming holidays give us an extra excuse to have fun and be creative. 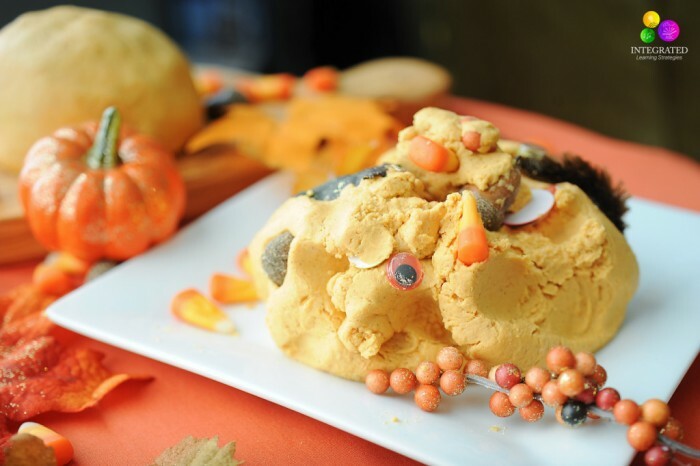 This year, to “spice” things up, we decided to not only make fun pumpkin spice play dough that our kids will love, but we wanted to add an extra sensory spin to help develop their fine motor skills and hand-eye coordination. And, what child doesn’t love the gooey, sticky feeling of play dough? First we made our fun pumpkin play dough with three simple ingredients. It’s an easy recipe anyone can make and it has the extra added bonus of smelling just like pumpkin spice. That way, not only is your child using their touch and feel, but their sense of smell as well. 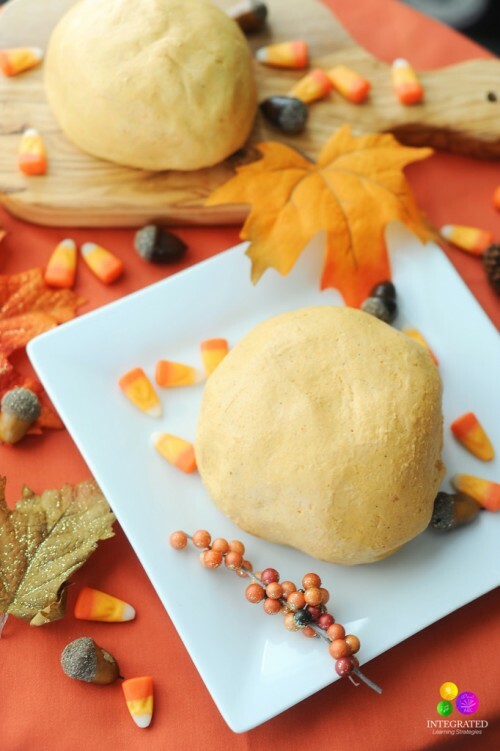 To make our pumpkin spice play dough fun and smell nice, all you need are three simple ingredients and you are in business. We made a large batch since we have so many students, but you can half this recipe to make a smaller batch for your kids. With our batch, we were able to separate the play dough into three large rolls big enough for three separate children to play with at one time. In a large mixer, add ingredients together adding additional cornstarch as needed until the dough is nice and firm. Add additional pumpkin pie spice if your child wants a stronger smell. Now for the fun part! 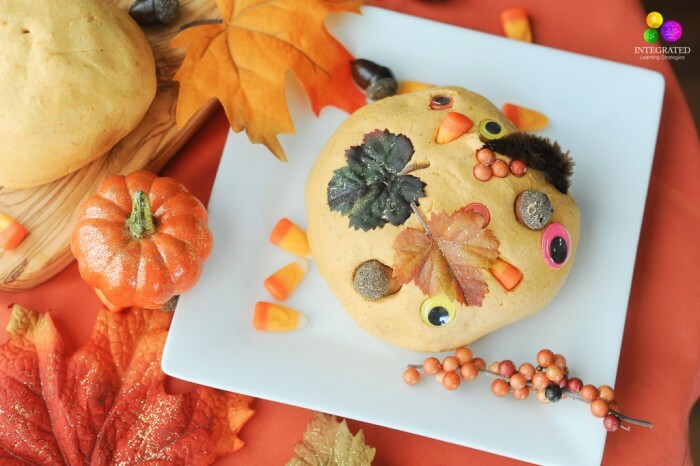 You have probably all tried rolling pins, cookie cutters and molds to create some fun objects and shapes out of play dough, but what if we took some fun textured objects and mixed them inside the play dough? 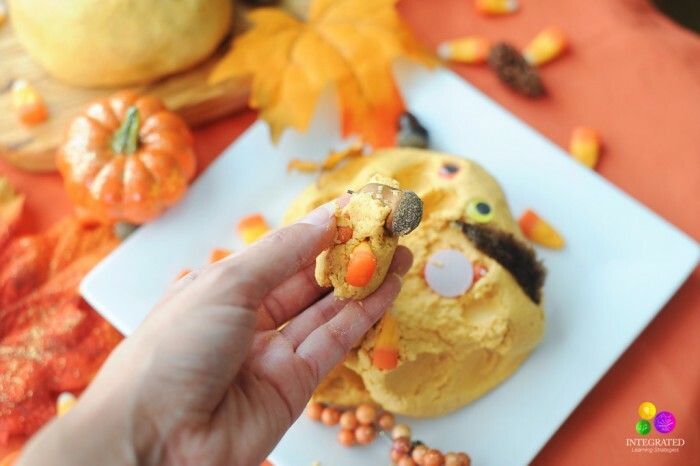 Add a few leaves, acorns, small pine cones, beads, candy corn, dried corn, and any other fun fall objects and mix it inside the play dough. Then ta-da! We now have our very own Where’s Waldo game that gives your kids a chance to dig through the play dough and find all the objects that are hidden. These types of sensory activities give your child the sensory stimulation they need while strengthening their fingers and hands to improve their writing skills. As an extra added bonus, as they work through the play dough to find the objects, they are using their hands and eyes to search for the items, which is a great hand-eye coordination activity to help them read words on the page and track letters and sounds when they are in school. Any time we can create sensory activities that touch all aspects of learning is great for kids, parents and teachers. Have fun and enjoy this beautiful time of year! 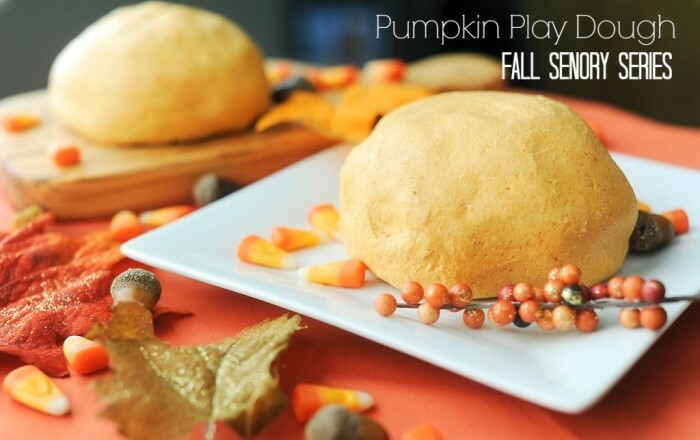 This post is part of the Fall Sensory Play series, hosted by The Jenny Evolution in partnership with The Sensory Spectrum. 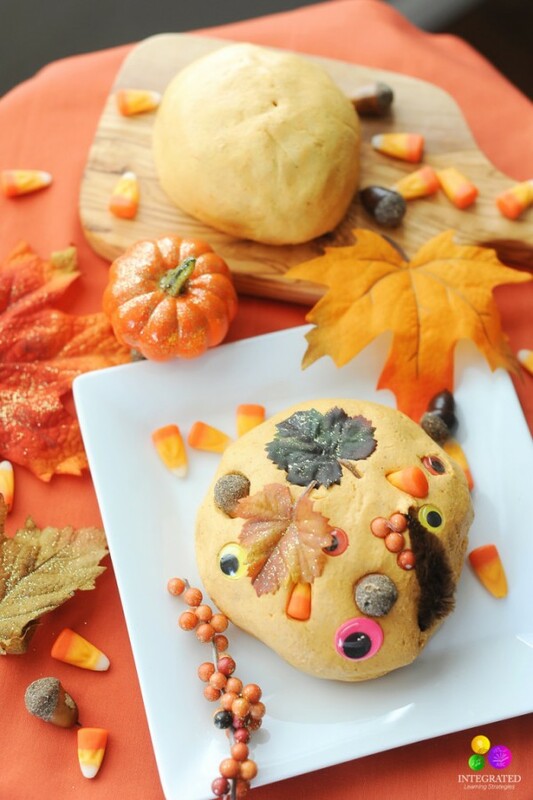 Go to the Fall Sensory Series to get the latest sensory fun for your kiddos! 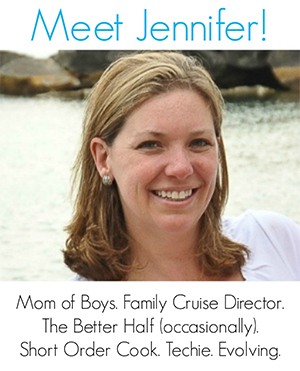 About Meagan: Meagan is part of the team at Integrated Learning Strategies, a Utah-based center dedicated to helping mainstream children and children with learning disabilities achieve academic success. Their services provide kids with non-traditional tutoring programs within the Davis County, Kaysville, Layton, Syracuse, Farmington, and Centerville areas. How long will the playdoh last? If I make it the night before will it still be good to play with in the morning? Just make sure to put it in a Ziplock bag so it doesn’t dry out.